This indispensable one-volume guide provides expert advice on the issues frequently encountered in matrimonial practice. 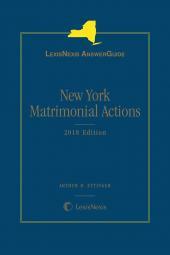 Authored by Arthur D. Ettinger, Esq., a leading matrimonial law practitioner, this indispensable one-volume guide provides expert advice on the issues frequently encountered in matrimonial practice. 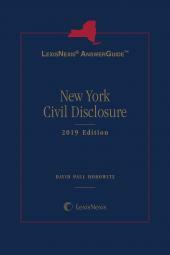 To ensure best practices and avoidance of potential practice pitfalls, LexisNexis AnswerGuide New York Matrimonial Actions includes over 60 detailed, task-oriented checklists, and more than 320 practice pointers (Warning, Strategic Point, Exception, Timing) on important topics, including jurisdiction, grounds, interim relief, disclosure, valuation, equitable distribution, custody and visitation, spousal and child support, and enforcement of orders and judgments. 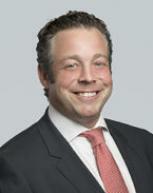 Arthur D. Ettinger is a shareholder and co-chair of the Matrimonial & Family Law practice group in Greenspoon Marder's New York office and has extensive experience representing and advising clients in all aspects of matrimonial and family law, including negotiating and drafting pre and post nuptial agreements and separation agreements and litigating child custody and complex economic issues throughout New York State. 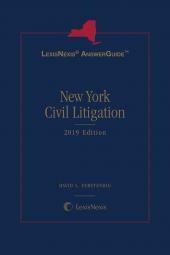 He is a member of the Matrimonial Law Committee of both the New York City and New York County Bar Associations, Practice Management Subcommittee of the Family Law Section of the New York State Bar Association and the New York College of Matrimonial Trial Lawyers, and lectures on matrimonial and family law issues. He was recently named to The National Law Journal's 2017 list of Divorce, Trusts & Estates Trailblazers.